Are Top Diplomatic Jobs Meant to Destroy Kenya's Opposition? 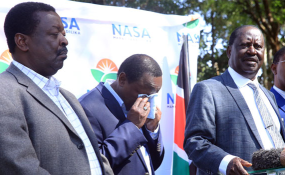 Three leaders of the National Super Alliance (Nasa) have put aside their political differences and resolved to work together for the sake of their collective political interest that was raptured by the January 30 "swearing-in" of Mr Raila Odinga as the people's president. The Nation has been told that Mr Odinga, Wiper leader Kalonzo Musyoka and Amani National Congress (ANC) leader Musalia Mudavadi have had a series of meetings to rekindle the dream they shared when they unveiled the outfit on January 11, 2017 at the Bomas of Kenya when they vowed to capture power in the last general election. According to a source, a series of meetings has seen the three leaders vow to work together for the sake of national unity and in solidarity with the ongoing crackdown on corruption. Minority leader in the National Assembly John Mbadi and the Senate Minority Whip Mutula Kilonzo Jnr said the return of Nasa is hardly surprising because the leaders have been in constant communication. Mr Mbadi said the three leaders have been together even if there have been no formal meetings of the coalition. "I have no information on the meetings. But if it is true then it is hardly surprising because it is a matter of public knowledge that Mr Odinga and Mr Mudavadi meet frequently," Kilonzo Jnr told the Nation on Sunday. Signs of a rapprochement among the leaders emerged last week when Mr Odinga asked ODM secretary general Edwin Sifuna, while on a routine tour of Vihiga County for party activities, to desist from doing anything or saying that would hurt Mr Mudavadi. Some accounts have suggested that Mr Mudavadi may have finally decided to throw his weight behind the handshake, which he has previously opposed as a deal between two individuals. Mr Mudavadi did not pick his calls the whole of Sunday. The source said that Mr Odinga is keen have a strong Nasa if the Building Bridges initiative, which he considers necessary for the country and the opposition's push for electoral justice since the August 2017 general election, is to succeed. According to the source, the strength of the initiative lies in having all stakeholders on board. "You cannot talk about uniting the country when you have abandoned the very people you were with in the struggle. Mr Odinga needs his colleagues," the source said. However, it appears that Ford Kenya leader Moses Wetangula is not part of the new plan as he has not been party to the meetings held so far. The source further reveal that Mr Wetangula's absence from the meetings - mainly held at Karen Country Club - is deliberate as he is perceived to have bolted to Deputy President William Ruto's stable. Mr Wetangula fallout with Mr Odinga and his eventual decision to look in Mr Ruto's decision was motivated by his impeachment as the Leader of Minority, a scheme he has placed at Mr Odinga's doorstep. A number of leaders from the opposition have confirmed the meetings involving the three but could confirm the extend of the deliberations as much as some of them were not willing to go on record for fear of being seen discussing information not meant for public consumption. Deputy minority leader in the National Assembly Robert Mbui insisted the three never stopped meeting after the handshake. "To be honest, these people meet frequently, sometimes in public and at times privately. I have on several occasions called Mr Musyoka to inquire on something. He then tells me to hold on so that he can consult Mr Odinga Raila," Mr Mbui told the Nation. Nominated MP Godfrey Ososti said he is aware the three have been meeting and if the discussions bears fruit then it will be a better thing for all. "The political future of our party leader-Musalia Mudavadi is better served when he is with Mr Odinga than any other politician. He cannot join Ruto's camp because it is already full," Mr Osotsi said, pointing out that together with senators George Khaniri (Vihiga) and Cleophas Malala (Kakamega) have now been vindicated after being branded as rebels for calling on Mr Mudavadi to work with the ODM leader. "It would be foolish for Mudavadi to start other political alliances with anyone angling for the Presidency in 2022.He better stick with Mr Odinga so that he can inherit his political bases," Mr Osotsi said. Kakamega senator Cleophas Malala said he was only aware of talks between Mr Odinga and Mudavadi, but added that it was a good thing that Mr Musyoka had been included in the talks.